Take a walk with me, just walk with me, take a walk with, come on, now make your neck work! This week the M.I.B. theme song is canon because Andrew and Diana are talking Men In Black with special guest Joel Buxton (writer, stand-up, sketch). Does this movie hold up, how amazing is Vincent D'Onofrio, practical vs CGI effects, and a title song we'll never forget. Do you want access to a special secret episode of the podcast every month? Then donate to the show on Patreon. You can gain access to secret podcasts, jokes from the future, and Q&A's. 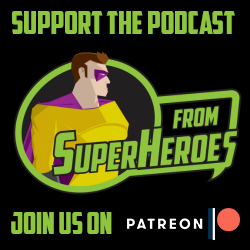 Visit www.patreon.com/fromsuperheroes and become our Patron. Come back next week for V for Vendetta!